Ttouch VS Reiki - Which Is Right for Your Horse? Importance of touch and massage techniques in keeping horses in tip-top condition. Horses are very physical animals. They like the touch of a hand or the nibble of a stable buddy on the withers. With the exception of abused or very frightened horses, human touch can have a calming and healing effect. Even those horses respond with time. Think of how your horse reacts when you are using a soft rubber curry on his winter coat as it sheds in the spring. Many horses lean into the curry and almost purr with delight. That circular motion is very similar to the Tellington TTouch system developed by Linda Tellington-Jones. Many massage techniques also make use of circular movements to settle tired and sore muscles. Of course, sensitive equine skin with its many nerve endings can be irritated by touch too - think of your horse stomping or biting at flies. Linda Tellington-Jones is known in the horse world for her endurance ride accomplishments but also participated in many equestrian sports. Her TTouch techniques have helped many horses, as well as companion animals and people. For TTouch, you make numerous small circling movements on your horse to stimulate the cells. Keep your thumb two to three inches from your forefinger, which should be resting lightly on your horse. The last joints of your fingers and the rim of your palm will be on your horse's skin. Do a circle and a quarter in a clockwise direction. You should be moving the skin, not just rubbing over the hair. This direction tends to be best for rehabbing your horse and improving his confidence. Some horses become more relaxed with counterclockwise circles. You will need to experiment to see what your individual horse prefers. You can move your hand to random locations on your horse or follow a set parallel pattern. Try both to see what your horse prefers. How much pressure you put on your horse will also vary. TTouch uses a scale of one to nine with one being the lightest pressure and nine being quite firm. Again, experiment to see what your horse likes. The type of circle and amount of pressure may also vary from day to day or with the location on your horse's body. If your horse is sore, he may relax best with light pressure to start, followed by firmer pressure as his muscles respond. The Python Lift uses the whole hand to gently lift muscle and skin to relieve tension and spasms. There are a couple of other basic hand positions. Other massage techniques have also been adapted to horses, really taking off in the 1990s. Massage can help sore muscles, work as part of a rehabilitation program to return a horse to full performance capability and help after daily workouts to keep a horse in prime shape. Massage can also help to relax a tense or nervous horse. Massage can be helpful to reduce tension in sore muscles and move inflammation out of an area. By increasing circulation to the area, toxins can be removed and excess fluid hastened out of the muscle you are working on. Better circulation means more nutrients and oxygen to the muscles. Combining these massage techniques with active stretches, you can improve your horse's range of motion. For a horse with an injury whose muscles in one area may be 'frozen' - not mobile or relaxed at all. A good massage can reduce tension, free up scarred tissue areas and loosen up the muscles. Massage is now included in many rehabilitation plans for horses recovering from injuries or surgeries. You can plan a massage session as part of your horse's daily routine or save it for after heavy workouts. A good massage session can relieve muscle spasms and help to gradually break down scar tissue. While many horsemen think of these therapies as ways to keep a performance horse in condition for competing, these are wonderful ways for you to interact with an older, retired horse as well. Remember that muscles both extend and contract. 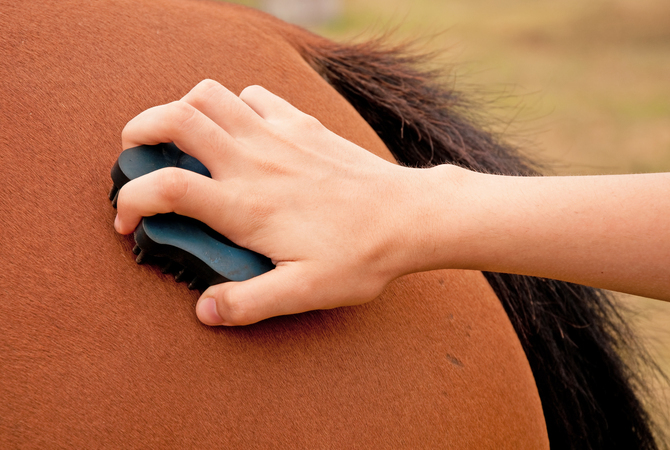 Doing a thorough massage will help your horse's muscles to perform both actions. With fatigued muscles that have built up the toxins from hard use, massage helps to move those toxins like lactic acid out of the muscle and back into circulation where they can be removed. While doing a full body massage you may pick up subtle differences in your horse's muscles from one side to the other. This can guide you in adjusting your work plan for your horse or looking for mild lameness that might have caused the difference. A less well-known hands on therapy for your horse is Reiki. Reiki is a healing therapy that channels outside energy through your hands into your horse's body. The goal is to balance your horse's energy in his body and mind. Reiki is a very safe healing therapy so you can't go wrong trying it. Ideally your horse will earn to enjoy and accept the energy transfer and actually approach you to solicit Reiki. Experienced practitioners can apply Reiki from a distance but initially you will need to have your hands on your horse. All three techniques discussed here - TTouch, massage and Reiki - require that you learn to perform the technique correctly. There are many books, DVDs and seminars or classes where you can learn these methods of keeping your horse in tiptop shape. It is best to try these therapies on your horse when you are calm and have plenty of time to relax and concentrate on your horse. Customizing your treatment to fit your individual horse is also important. One horse may love more pressure while another may dance away from firm pressure. A horse may enjoy the warmth of a Reiki hands on session or act irritated. Experiment and see what your horse prefers. While many horsemen think of these therapies as ways to keep a performance horse in condition for competing, these are wonderful ways for you to interact with an older, retired horse as well. The time, and the touch, is precious to older equines who may not be getting a lot of attention. In summary, there are a number of hands on techniques that can help your horse both physically and mentally. Do your research, get some training via home study or a class and try it!